Heat sugar and water in a heavy med to large saucepan over medium heat. Allow mixture to boil until water begins to cook down and only sugar remains (about 5-8min), stirring occasionally. While stirring constantly. cook sugar until it melts and turns a nice golden amber color. Sugar will clump at first, then start to melt as it cooks into a rich brown colored liquid. Patience is important here, keep stirring! Once color is achieved and no clumps remain, add the sliced butter, while continuing to stir. When butter is melted, slowly stir in cream and boil for about a minute. 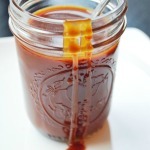 Remove caramel sauce from burner and stir in salt and vanilla until combined.